Start off your visit on the 3rd (Thu): pause for some photo ops at Casa Batllo, then admire the striking features of Basilica of the Sagrada Familia, then pause for some serene contemplation at Barcelona Cathedral, and finally wander the streets of El Barri Gòtic. For photos, more things to do, traveler tips, and tourist information, read Barcelona online trip itinerary builder . Sao Paulo, Brazil to Barcelona is an approximately 14.5-hour flight. You can also do a combination of bus and flight. Due to the time zone difference, you'll lose 4 hours traveling from Sao Paulo to Barcelona. When traveling from Sao Paulo in October, plan for slightly colder days in Barcelona, with highs around 26°C, while nights are about the same with lows around 18°C. Cap off your sightseeing on the 3rd (Thu) early enough to travel to Paris. Kick off your visit on the 4th (Fri): admire the landmark architecture of Cathédrale Notre-Dame de Paris, then admire the masterpieces at Musee d'Orsay, and then take in the architecture and atmosphere at Basilique du Sacre-Coeur de Montmartre. Here are some ideas for day two: take a stroll through Île de la Cité, contemplate the long history of Eiffel Tower, then pause for some photo ops at Arc de Triomphe, and finally admire the masterpieces at Louvre Museum. For photos, more things to do, and more tourist information, use the Paris online trip itinerary builder . You can fly from Barcelona to Paris in 5 hours. Other options are to do a combination of train and flight; or drive. Expect little chillier temperatures when traveling from Barcelona in October; daily highs in Paris reach 19°C and lows reach 10°C. Cap off your sightseeing on the 5th (Sat) early enough to catch the train to London. On the 6th (Sun), get engrossed in the history at The British Museum, admire the masterpieces at National Gallery, and then step into the grandiose world of Buckingham Palace. Get ready for a full day of sightseeing on the next day: take in the architecture and atmosphere at St. Paul's Cathedral, admire the landmark architecture of Westminster Abbey, then take an in-depth tour of Natural History Museum, and finally admire the striking features of Houses of Parliament. For maps, reviews, other places to visit, and other tourist information, read London vacation builder site . Traveling by train from Paris to London takes 2.5 hours. Alternatively, you can fly; or drive. The time zone difference moving from Central European Time to Greenwich Mean Time is minus 1 hour. In October, daytime highs in London are 19°C, while nighttime lows are 10°C. Finish your sightseeing early on the 7th (Mon) to allow enough time to travel to Amsterdam. Kick off your visit on the 8th (Tue): wander the streets of The Jordaan, then explore the world behind art at Rijksmuseum, and then explore the world behind art at Museum Het Rembrandthuis (Rembrandt House). Get ready for a full day of sightseeing on the next day: explore the world behind art at Stedelijk Museum Amsterdam, then take an in-depth tour of Van Gogh Museum, then contemplate the long history of Begijnhof, and finally contemplate the long history of Anne Frank House. To find ratings, traveler tips, other places to visit, and tourist information, use the Amsterdam online journey planner . Fly from London to Amsterdam in 3.5 hours. Alternatively, you can take a train; or do a combination of train and flight. The time zone changes from Greenwich Mean Time (GMT) to Central European Time (CET), which is usually a 1 hour difference. In October, daytime highs in Amsterdam are 17°C, while nighttime lows are 9°C. Wrap up your sightseeing on the 9th (Wed) to allow time to travel to Rome. Start off your visit on the 10th (Thu): take in the spiritual surroundings of Basilica di Santa Maria Maggiore, admire the local landmark of Trevi Fountain, then steep yourself in history at Roman Forum, then steep yourself in history at Palatine Hill, and finally steep yourself in history at Colosseum. On the 11th (Fri), you'll have a packed day of sightseeing: make a trip to Pantheon, then browse the exhibits of Vatican Museums, then take in the architecture and atmosphere at Santa Maria in Trastevere, and finally admire the masterpieces at Galleria Borghese. 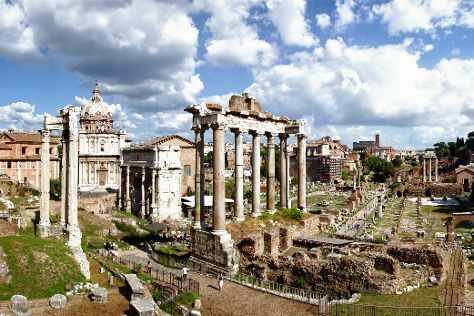 For traveler tips, maps, where to stay, and tourist information, read our Rome online vacation planner . Traveling by flight from Amsterdam to Rome takes 5.5 hours. Alternatively, you can do a combination of flight and train; or drive. Expect a bit warmer temperatures when traveling from Amsterdam in October; daily highs in Rome reach 26°C and lows reach 15°C. On the 12th (Sat), wrap the sightseeing up by early afternoon so you can travel back home.